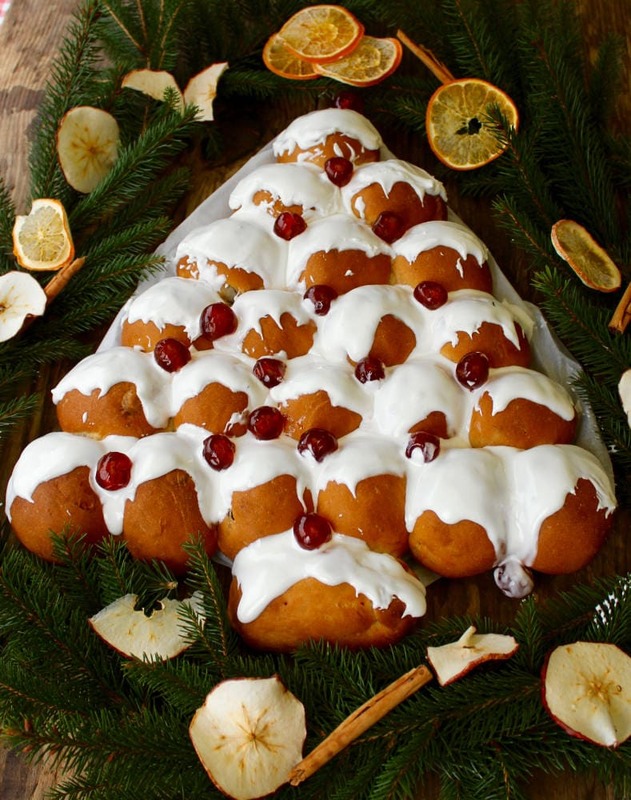 Christmas Tree Bread makes a great centrepiece for any festive table – a delicious Christmassy tear & share bread packed with fruit & spices to be enjoyed by all the family! I love Christmas time and Christmas baking and it’s definitely starting to feel festive in the Kitchen Shed. 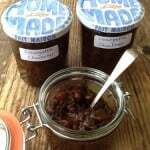 In fact the Kitchen Shed has been smelling Christmassy for a few weeks now since I started making some of the goodies for our gift hampers. According to my Christmas counter it’s 33 days to Christmas as I write this post … I better get those hampers finished ! My very first post was a Christmas cake recipe and I can’t believe we’re coming up to my blog’s first anniversary. 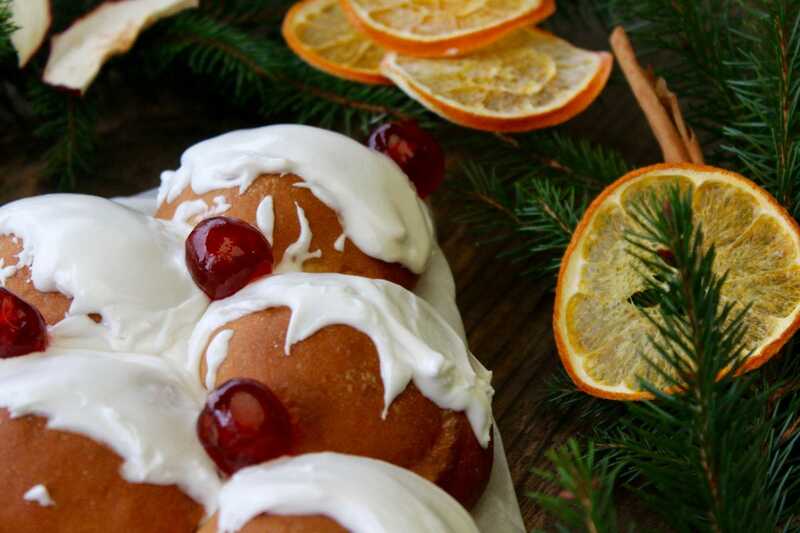 I’m hoping to post a few more Christmas ideas this year so I thought it would be fun to kick off with a Christmas Tree Bread to make and share with family and friends. Although I went for a red and white theme on my Christmas Tree Bread, you can play around with the decorations: green cherries and pistachios would look great, sliced apricots and orange peel … I’ll leave it up to you. 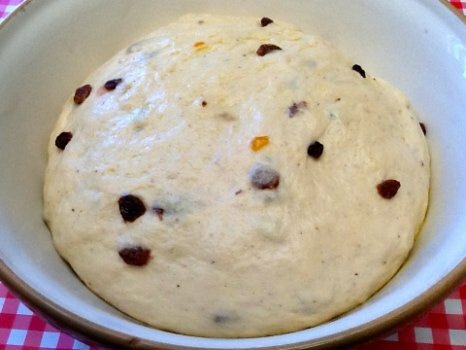 The enriched dough is easy to make (not too sweet, so it doesn’t need proving overnight) and the fragrant spices combine perfectly with the sweetness of marmalade, icing and cherries. I was so pleased with the Christmas tree effect that I decided to make a savoury version too, see what you think. Tempted? If you’d like to try this recipe for yourself, here it is an easily printable form. Just hit the PRINT button on the recipe card below. Transfer the dough to a floured work surface and divide into 22 portions of approximately 55g to 60g each. Shape 21 portions into balls and the last piece into an oblong for the tree trunk. 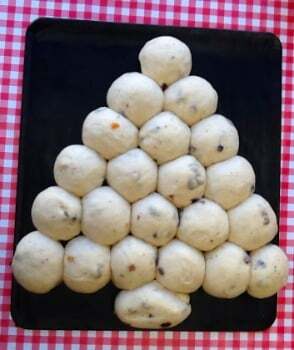 Place the dough balls onto the baking tray in the shape of the Christmas tree – see photos – with 6 dough balls on the first row and the tree trunk underneath at the centre. Continue with 5 dough balls on the second and so on until you have a single dough ball at the top. 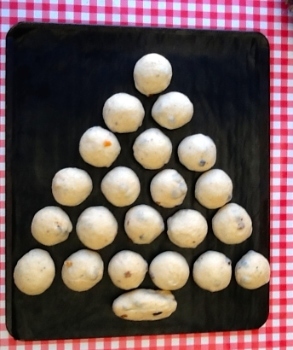 Leave no more than 2.5 cm (1 inch) between each dough ball and when risen they will touch each other, which maintains the Christmas tree shape. Cover and leave to rise for about 45 minutes or until well risen. Bake in the oven the 20 to 25 minutes until golden brown. Sift the icing sugar into a bowl, add 2 tablespoons of boiling water and mix. You want the icing to be quite thick and not too runny so you can get the snow effect. You may need to add a touch more water but add a drop at a time. Let your bread cool for about 10 minutes (it still wants to be warm) before you add the icing. Prop up your cooling rack on one end so that the icing can drip a little. Place about a teaspoonful of icing on the top of each bread ball and spread it to cover the tops. I just used the teaspoon to spread the icing a little, see photos. 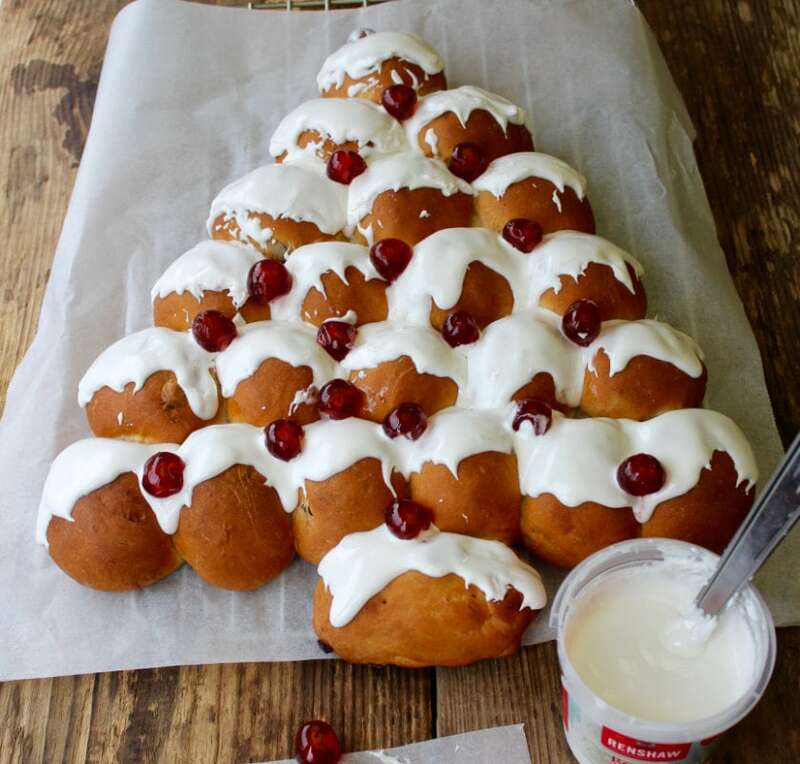 Place the cherries on your Christmas tree bread and leave to set. Preparation time does not include dough resting times. We might give this a go in the office and use maybe a lemon icing for the topping. Thanks for the excellent blog post! Very nice ! Such a good idea! Looking forward to try on your recipe! You’re welcome Otilia & thanks for inviting me to join #FoodieFriday. Such a gorgeous bread! I haven’t made any dried fruits this year (though – points to me, I did buy the Bermudian rum to do it, LOL) but this might have to force me to go out and just buy some. Yum. This looks so pretty! I love baking bread, and this looks like an awesome idea to bring to a party! I’m pinning and will try it out soon! Sarah, I love this! From the shape, to the way the icing looks like snow falling onto the tree and the inclusion of marmalade, all so perfect for the festive season! I wonder if I could bake it and freeze un-iced ready for Christmas Day evening? 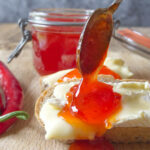 Thanks so much for linking to #festivefoodfriday. Thanks Sarah & you’re most welcome, it’s a pleasure to join #FestiveFoodFridays. The baked tree will freeze well & what a great idea to ice for Christmas Day evening. 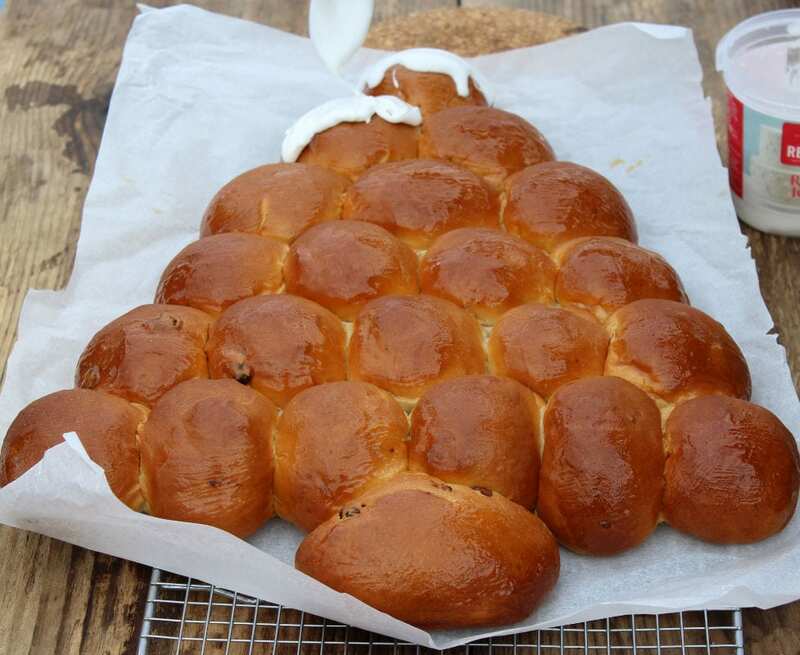 I hope you have fun making Sweet & Spicy Christmas Tree Bread. 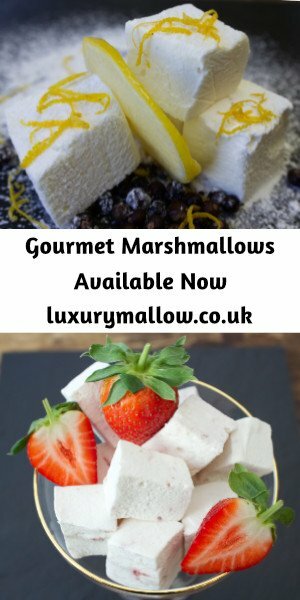 Saw this on #CookBlogShare! This looks so good, perfect for the Christmas Eve Buffet we usually have! Thanks Sophie, hope you enjoy making Sweet & Spicy Christmas Tree Bread. Thanks Samir, it’s an ideal centrepiece for the table & great for sharing.